Oh my God! this song is more than AMAZING!!! It's beautiful! I love Evanescence and AMy Lee too because she is a goddes! I'm looking forward your answer...and please come to Argentina because I'd love to see her with my own eyes.. I want "The open door" now!!! i am so glad you are back evenescence i have been so fed up with all these crap bands at least now i will have some decent music to listen too. I love amy lee u rock!!! I just read the review Big Dave Dawson or whatever your name is ROCK ON!!!! 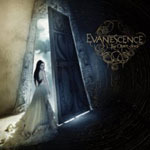 Number one Evanescence is the bomb, number two you don't insult my favorite band because it just shows how stupid you are, cause you didn't have to say anything at all. I haven't heard this song yet but I really want to does any one know how I can listen to it. If someone can help me out will you email me?Thanks.All I can say is that I think Evanescence should have STAYED number one on the chart they are the best! Just wanted to say that I am a huge fan, have been for a long time. I am so excited that you came out with another CD. I can't wait for October 3. I love this song as well as all of your others. You have so much meaning in the lyrics, that I can actually relate to it. Your voice is beautiful as well as your heart. Thank you for sharing them with all of us.